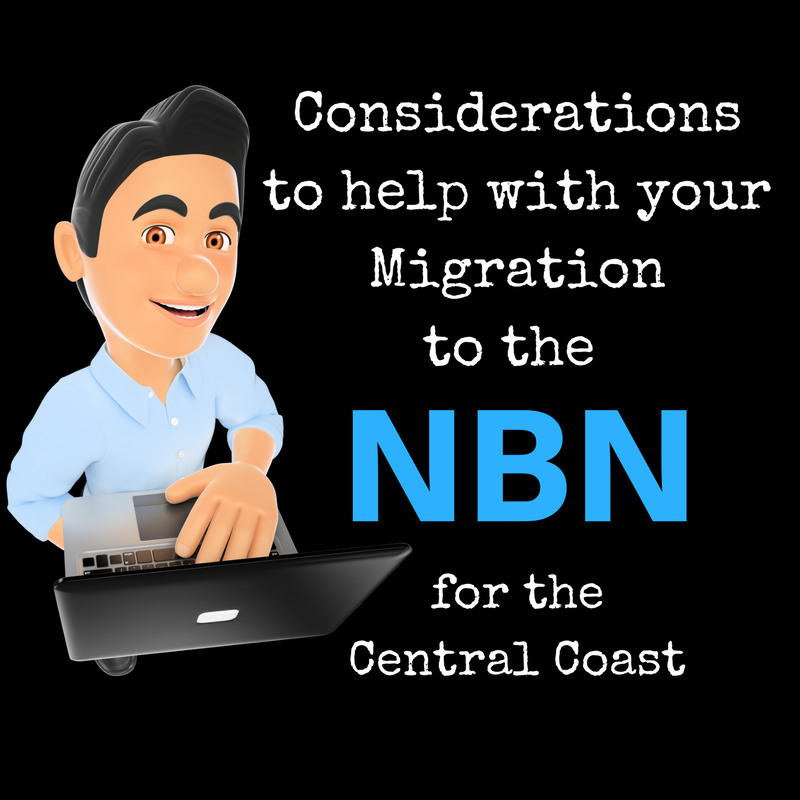 Considerations to help with your migration to the new NBN phone & internet services for the Central Coast. The more information that we have, the better decisions we can make. The nbnTM network in Australia is currently replacing most of the existing landline phone and internet networks. Most areas of the Central Coast will be connected using FTTN - Fibre to The Node - which is a mix of joining the existing copper cables with the latest fibre-optic cables that are made from glass, at a connection point called a Node. The goal is faster and more efficient internet service, however with all government plans - there are always hiccups along the way. The following is some important information that can help you feel in control of your migration to the NBN. Because we are in an NBN Ready area, all new orders or alterations to accounts/connections will see the customer moved from the ADSL/Analogue Phone network onto the NBN network. If you make ANY changes to your current plan - You will immediately be moved onto the NBN - the RSP's (Retail Service Providers e.g. Telstra, Optus, iiNet etc.) generally take this as your consent because you are technically ending your existing copper network agreement. For example; even if you decide to move from 20Gb to 100GB on your current plan, you will be migrated onto the NBN. Most areas will have until after June 2017 before the current network is due to be cut off. You still have plenty of time to get information specific to you & make your own choice! If you feel pressure or confused from a phone call - terminate the call - Hang up! - It's a very competitive market and they are very good sellers with the aim of getting you onto a contract ASAP by advertising, door knocking etc. etc. •	Write down details of calls- Get control of the call yourself - tell them to wait! Ask the caller what company they are from, their name or employee ID, if they don't want to give you their details, don't talk to them. •	If you want to keep your existing phone number, you will need to specify this is included in your new order with your chosen provider. •	Staying with your current provider seems to create less problems with keeping your existing number, however this is not always the case. Remember, as good as the NBN is claiming to be - it will not work during a power blackout. If you want your phone/internet to work when there is a power failure you should seek independent advice as to purchasing a compatible battery back-up unit. Other things to consider are fax services & the position of where your main phone point will be in your home. There will only be 1 active phone point in your home after the change-over, this usually ends up being the point that's nearest to your front boundary & you usually don't have a say in this. If you have a computer in the spare room & your phone is in the kitchen, there may be connection changes or further new equipment required. Some additional work & cost may be necessary that you didn't anticipate and depending on what setup you have in your home, it may affect your decision of the service provider that you choose. •	Currently your phone does not need a power point. The new system does. •	The modem must be connected to the phone line (the connection socket in the wall) and a power point. •	The power adapters are wide and often take up a complete socket. You shouldn't do the ‘double adapter/ power board tower' - it's dangerous! •	Think about the equipment that you have and where it is - Draw a diagram, make a list - decide where you want what. MEDICAL ALARMS/FIRE ALARMS etc. can also be affected by the NBN. If you have a safety critical device, (e.g. medical alarm, fire alarm or emergency lift phone), speak to your device or retail service provider about alternative solutions. The nbnTM involves new technologies, which some existing devices may not be compatible with. If you have a medical alarm it's important that you register it with nbn and call your medical alarm provider for advice to find out if & how your service will work on the nbnTM Network. You will need to discuss with your alarm provider/manufacturer what/if you need to do anything for your device. Make sure you do this well before your existing landline phone network is disconnected and seek independent advice if you are not sure what to do. •	Call nbn on 1800 227 300 or visit nbn.com.au/medicalregister and register your medical alarm. •	Call your medical alarm, autodialler or emergency call button provider for advice and to find out if your services will work on the nbnTM network. •	Call your phone or internet provider and tell them you need the same Priority Assistance Service levels over the nbnTM network (if applicable). •	Test your medical device and alarms are working after any changes are made. There's no denying that there have been ongoing issues with the migration of the NBN. Having a forward plan on your part can save a lot of grief. Research what product that best suits your personal needs. Make sure you order your new connection when it suits you, preferably within 2-3 months before your particular due date for the copper network to be cut-off at your address. When you do place an order, it will be with your chosen Retail Service Provider. They then deal with the nbnTM for ordering your connection - Your only point of contact will be your RSP - Not the nbn co. And finally, have a mobile phone available for use if you happen to lose your phone connection during the transition. Whilst the government may have promised the NBN to be a seamless transition - the reality is for some it has been a complicated mess. Ensuring you know and can do all you can on your end is the best course of action for a more positive outcome.